In Rough Stock Preparation, I covered the tools and the first stage of stock preparation, breaking boards down into small pieces. This is where the fine dimensioning takes place. The pieces have rough surfaces and rough-cut edges to remove, along with any extra margin. In each dimension, this first establishes a reference surface, then takes the opposite surface down to the finished size. Now appearance and accuracy matter. With all three planes, it's tempting to move the plane just by pushing with your arms, but this will wear them out quickly. Instead, make it a whole body motion. Your body is a 100 to 200 lb. mass standing up on a 4 to 6' lever arm, use it along with your arms. With your feet apart, step into the motion, leaning off your rear foot into your front as you push. Your body mass then provides the force and momentum to carry through the cut. You can even hold the plane in a fixed position relative to your body to help you develop the motion. For long pieces, shuffle sideways in repeated steps to create one long fluid stroke, or simply work one section of the piece at a time. As you start the stroke, with the heel of the plane hanging off the piece, apply most of the down pressure at the toe of the plane to keep it flat. Otherwise the tail will droop and you'll end up rounding the end. As you progress through the stroke, shift the down pressure from toe to heel, so that as you complete the stroke, the toe doesn't droop off and round off the far end. Occasionally you need to take swooping strokes for partial cuts on the near or far end, either starting normally and swooping off like a plane taking off, or swooping down in the middle like a plane landing. This all takes some practice to coordinate. Practice on some scraps to develop the motions without worrying about how well the actual planing job is going. You may feel pretty awkward at first, but it quickly becomes graceful and efficient. The combination of body swing and arm push gives you power and control. Plane with the grain, not against it. That means you want the grain rising away from you. Look at the side of the piece adjacent to the side you will be planing. If the grain lines go upward as they move away, that's the direction to plane. If you plane against the grain, with the grain lines falling away from you, the plane will catch and tear out, possibly taking out chunks. If that happens, try spinning the piece around and going the other direction. Sometimes it's hard to read the grain, so you just have to try a test pass in each direction and see how it goes. While one direction will be rough, one should be much more smooth and shiny; that's the direction to plane. If the grain of a particular piece is being uncooperative, it may help to skew the plane diagonally to the direction of cut. This lowers the effective cutting angle of the iron for a cleaner cut and provides a bit of shearing action, at the cost of a narrower pass. 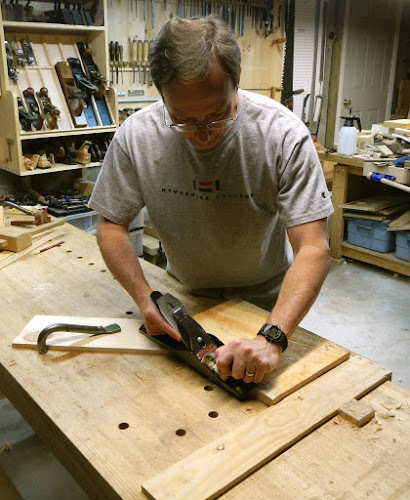 Use the medium jack plane to take the back edge down first. Pick one face of the workpiece to start with. This will become a reference surface. 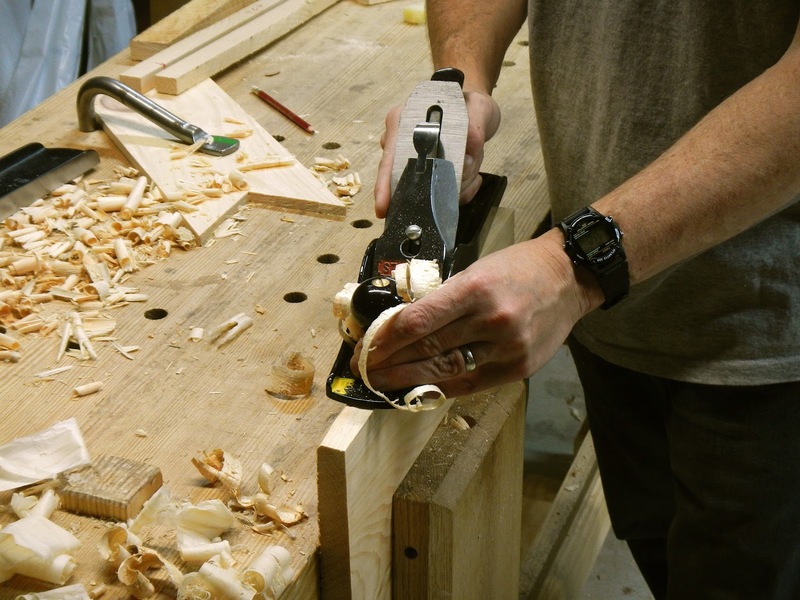 Secure the piece flat on the workbench, then use the jack plane to take the back edge down. This prevents blowout of the far edge (spelching) in the next step. In order to equalize the relative moisture of the two faces, remove roughly equal amounts of material from each, half from this face and half from the other when you do the thicknessing step. Otherwise the piece may warp after planing due to differential moisture levels. Even lumber that's been drying for years still has moisture trapped in the center. The exception to this is when you've resawn a piece, exposing the inside to the air. In this case, don't worry about the relative moisture levels, just focus on getting a flat, smooth face. If you have the time, stack and sticker to parts to allow air to circulate around them for a few days to help equalize the moisture. If any warping occurs, you'll be able to plane it out, though this eats up your margin quickly. 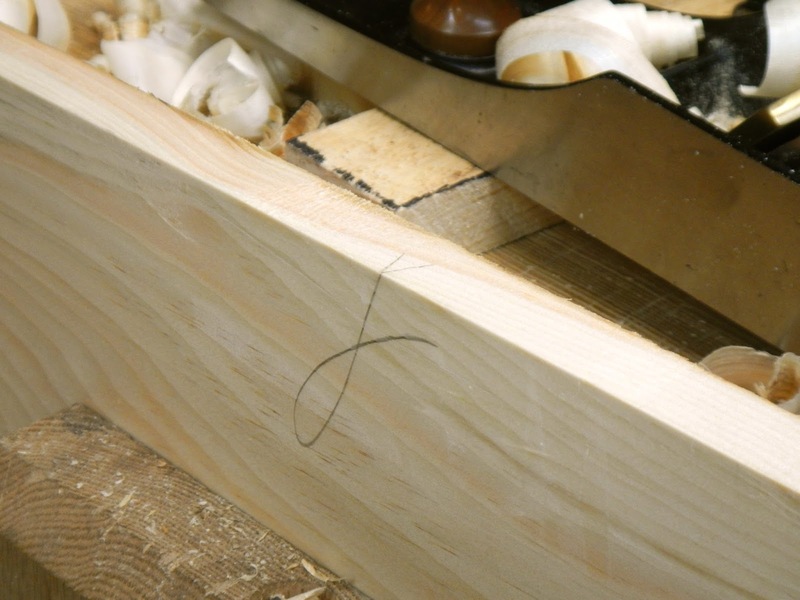 To get the surface down quickly, plane directly across the grain with the jack. This allows you to set it for a heavy cut and take thick shavings. If there's a lot to remove, you may need several passes. You can also plane on a diagonal. Overlap the passes to take a uniform amount off across the entire face. If there are obvious high spots, plane them down selectively, but be careful not to spend too much time in one spot and create a divot. 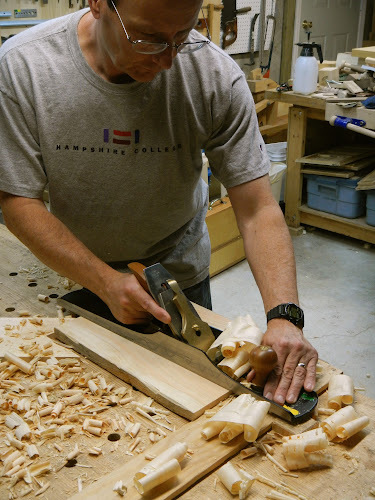 Planing across the grain, the cambered iron of the jack plane takes the surface down quickly. While using both the jack and the jointer, periodically check the overall flatness of the surface with winding sticks. Set them across the ends of the piece, then squat down and sight across them. If their top edges are parallel, the piece is flat. 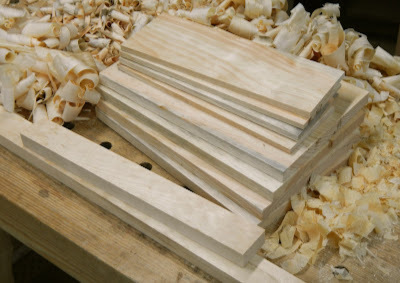 If not, the pieces is in wind (pronounced as in "to wind a clock"); the length of the sticks will exaggerate the twist, making the high and low corners apparent. For long work, you may want to check several spots progressively down the length from the end. ...then sight across them looking for a high corner, such as here at the back right. To correct wind, you can take selective passes over the high spots with the plane, or plane diagonally from high corner to high corner. Check progress frequently with the sticks to avoid overcorrection. The jack can quickly correct gross wind, but don't worry about getting it perfect, because the jointer is the better flattening tool. Deal with warp similarly to wind. You may need to shim a corner so the piece rests flat. For a face bowed upward in the center, plane with the grain on the hump to bring it down even with the edges. 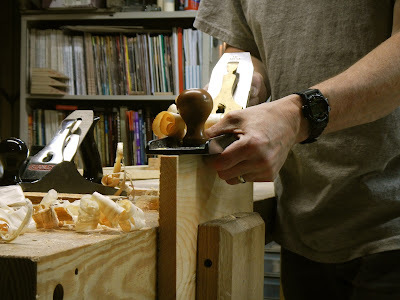 For a face bowed down (cupping), plane across the grain to bring the edges down even with the center, taking advantage of the bridging effect of the plane bed across the high spots. 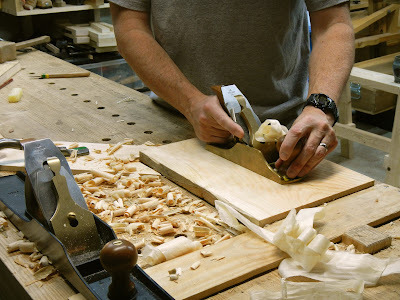 Once you've roughed the surface down sufficiently with the jack, switch to the jointer to get final flatness, taking overlapping strokes with the grain. The initial passes will just nip off the high spots, so it may seem like the plane isn't accomplishing anything. But after a couple passes the jointer will begin to take longer, wider shavings. Planing with the grain, the long jointer plane takes long, wide shavings as it flattens the surface. For larger pieces, it may help to take diagonal passes across the face to establish initial flatness, then switch over to straight down the length. Lay the edge of the plane along and across the surface as a straightedge to judge its flatness. Check it with the winding sticks. Run your fingers across it to feel for irregularities; they're incredibly sensitive instruments. Stop planing as soon as you have a satisfactory uniform flat surface. Finish up the face with the smoother, set for a very fine cut. This is the final cleanup step. It won't appreciably change the flatness as long as you take a uniform set of overlapping passes. You may want to delay final smoothing until later, perhaps even until after some assembly is complete, since the fine surface may get damaged during work. The short smoother plane takes very fine fluffy shavings as it smooths the surface. In order to equalize the moisture exposed in both faces, take roughly half the waste off of this first face. Don't worry about removing an exact amount of material. 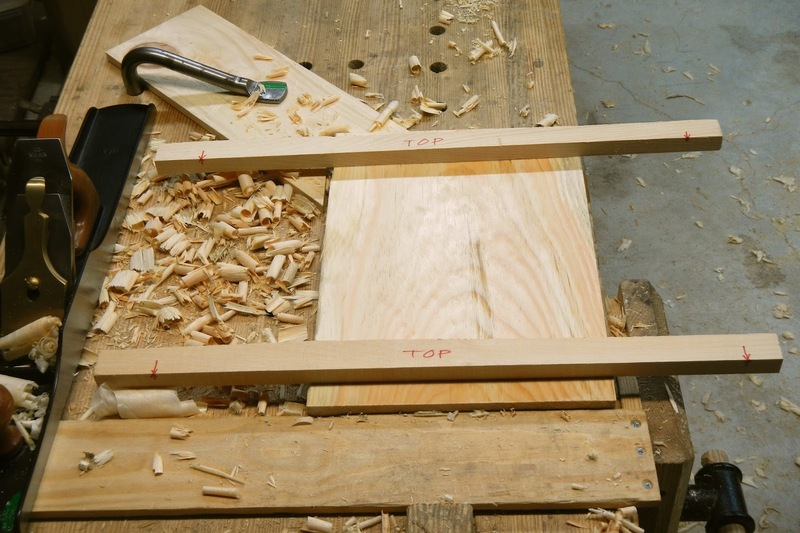 The opposite face is where you'll plane to a specific thickness. When faces have unequal moisture content, for instance if you just plane a little bit off the original dry face of the piece, then remove a lot from the other side and expose moister interior wood, it can warp as it dries out. Mark this face with the traditional cursive "f", where the tail runs off the edge that you will work next. The traditional cursive "f" mark for the reference face. If you need to remove a lot of material, you can minimize warping by roughly planing one face, then roughly planing the other face. Then stack the pieces in your workshop with stickers between them (stickers are scraps of wood at each end that separate the parts and allow air to circulate around them) for a few days or longer. After the newly exposed faces have had time to dry out and equalize with the humidity level in your shop, you can do the final planing of each face in the FEWTEL sequence. Stacking and stickering like this is also good to do when you resaw stock, since you are exposing the moister interior wood of the board. Note that "moister" doesn't mean dripping wet. The difference is probably only apparent with a moisture meter. But even lumber that has been drying for a long time can have measurable differences between surface moisture and interior moisture. 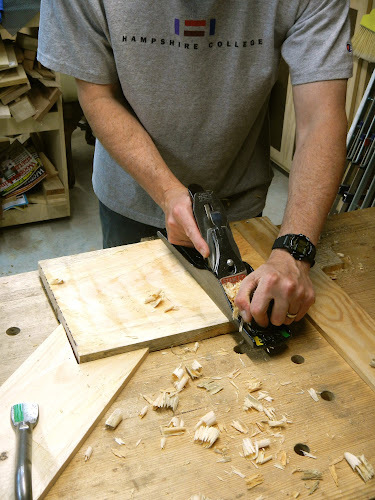 Work a rough with the jack plane set for a medium cut. If the edge is really rough, for instance if you did a rough job ripping the piece, start with the jack plane set for a medium cut. 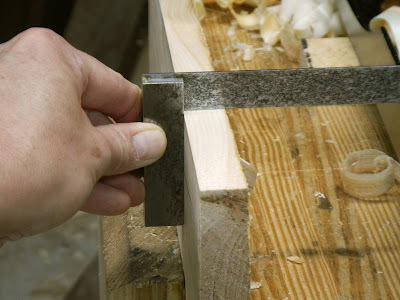 If there are significant high spots, you can work them individually, either along the grain or in small diagonal bites. As soon as the edge is reasonably consistent, switch to the jointer. Hook your thumb behind the tote of the plane and wrap your fingers around to the bed (figure 22). The knuckle of your index finger acts as a guide along the face of the board. Using the jointer, wrap your fingers around the bed so that the knuckle of your index finger acts as a guide to help maintain a 90 degree square cut. Plane with steady strokes, keeping the plane at 90 degrees to the face. With practice, you will be able to form a 90 degree edge easily. Check you work periodically at each end and the middle with a square. You can start with a heavier cut, then dial it down to a thin cut for the final strokes. Remember, the thickness of cut is like the gear shift in your car, set to thick cut for fast removal, then thin cut for slower, more careful removal. 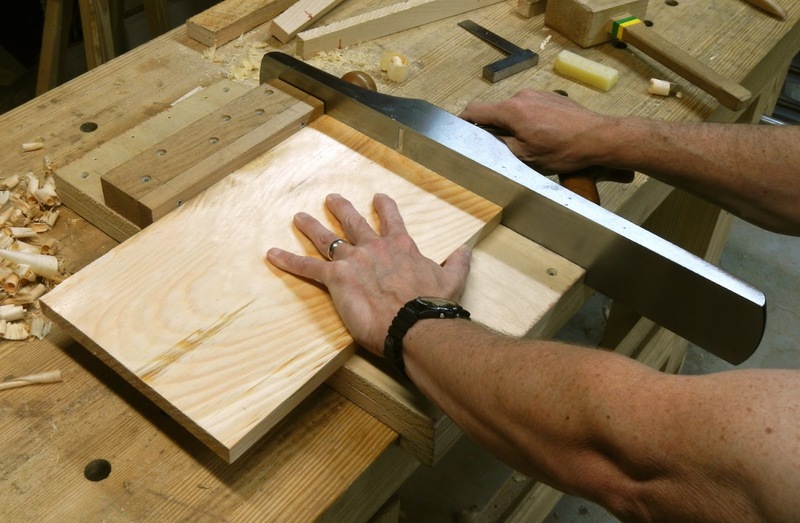 Work with steady strokes as you hold the plane square on the edge. Check the edge at multiple points frequently with a square. Hold the stock of the square against the reference face. To correct a high side, center the plane on the ridge or a little outboard of it. Take a couple passes to bring it down even, creating progressively wider shavings. Check with the square, and stop when you get a consistent wide shaving. Be careful, because it's easy to overcorrect. To correct a twist, where one side starts high, then the other side becomes high, run the plane diagonally from one high point to the other. 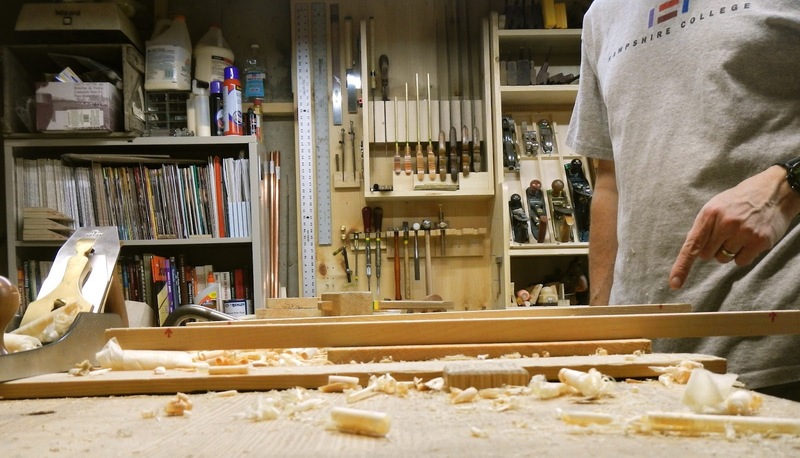 You can also selectively plane a couple shavings from the high spots, then take full length strokes. Remember to keep the plane from drooping off the ends at the start and end of the stroke, or you'll end up with a rounded board instead of a straight edge. If you do get some rounding, correct it by taking a stroke that start a couple inches in from the near end and ends a couple inches from the far end, hollowing out the high portion. Then take full length strokes. You only need to take enough material off to establish a flat reference edge. The opposite edge is where you worry about planing to a specific width. Mark the edge with the traditional "v", where the point meets the tail of the face mark. From now on for best accuracy, only reference your gauge and square off one of these two marked surfaces. The traditional "v" mark meeting the face mark. This is now a known square corner, serving as reference for the other face and edge. This is where you start planing to a specific dimension. 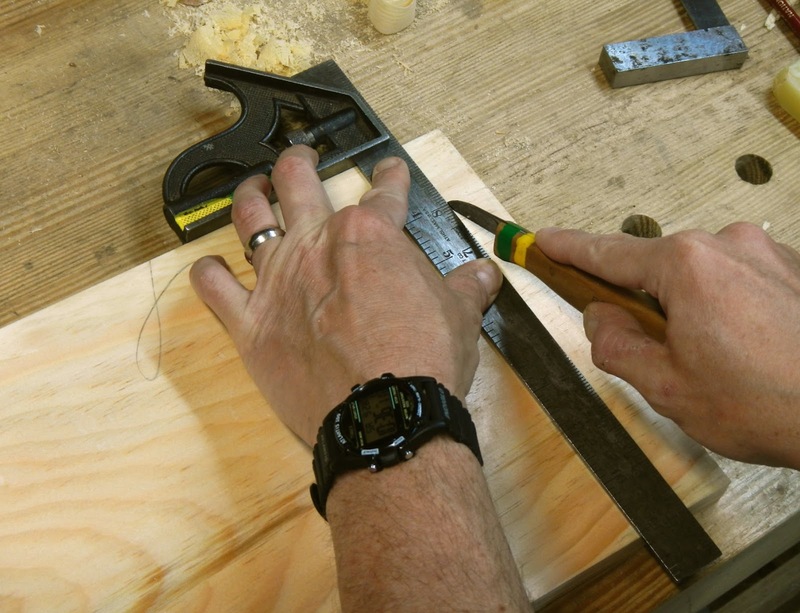 Measure from the just-planed edge and mark the final width, or run a marking gauge down it. If you need to remove a lot of material, say a half inch or more, it might be worth ripping most of the excess off rather than planing it all. Plane this edge exactly the way you did the first edge, starting with the jack. Set for a heavy cut, it makes fast work of any remaining width. However, now you are working to a line. Take short diagonal nibbling chips, working down the length, then back off the cut for straight passes. Take as many passes as needed to get it down to an amount manageable with the jointer. Joint this edge, paying close attention to the line. Check for square periodically. Now accuracy counts more than speed. The margin for correcting errors dwindles rapidly. If one end gets closer to the line than the other, take partial swooping cuts to even it up, so that your final finer passes are taking a full length consistent shaving. Stop when it's dead on the marked line. If necessary, you can finesse this width one shaving at a time to perfect the fit. Scribe a line all the way around for thickness. Scribe a line all the way around the edges and ends of the piece to mark the desired thickness. Because the reference face where your gauge registers is flat, you know that the scribed line parallel to it marks out a flat surface. Plane this face exactly the way you did the first face. As with the width, now you are working to a line. Using the jack, take it down to an amount manageable with the jointer. 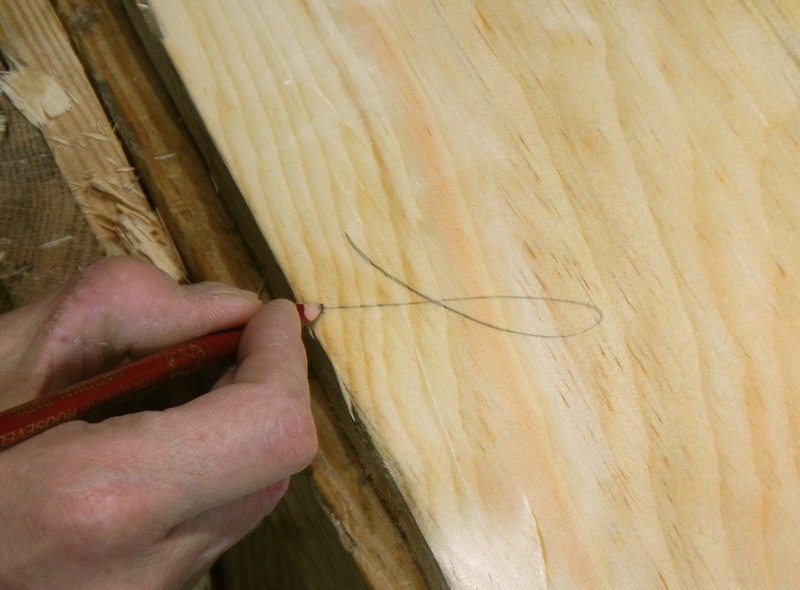 As you work with the jointer, periodically check around the edges for the scribed line. Adjust the cut to fine shavings as you get close. Once you reach the line all around, finish up with the smoother. Like the width, the thickness can be fine tuned a shaving at a time. The end grain on a shooting board. Shoot one end of the piece on a shooting board. This is the precision secret weapon of hand tools. It's carefully built with a fence exactly 90 degrees to the bed where the plane rides on its side. Lubricate the sole and side of the plane. Hook the front of the shooting board over the front of the bench, and set the reference edge of the piece against the fence. Shoot the plane repeatedly down the end, taking fine end grain shavings. Be careful not to rock the plane. Aim to finish the stroke well past the edge of the piece, like following through on a golf swing. 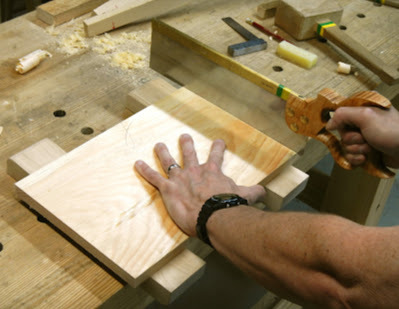 Use a large plane so its momentum carries through the cut, or use a low-angle block or bench plane. Since this is end grain, the iron needs to be extremely sharp to cut cleanly. The resulting end will be square in relation to both the edge and the face. You can also plane the end similar to the way you did the edge, for instance for wide panels too big to fit on the shooting board. However, end grain is much more difficult to plane, so set the plane for a very fine cut. Scribe a line square across and all around both faces and edges. Plane from each corner in to the middle, paying close attention to the line along the way. Don't plane all the way across and off the far corner, because it will tear out. It may help to skew the plane, reducing the effective angle of cut. 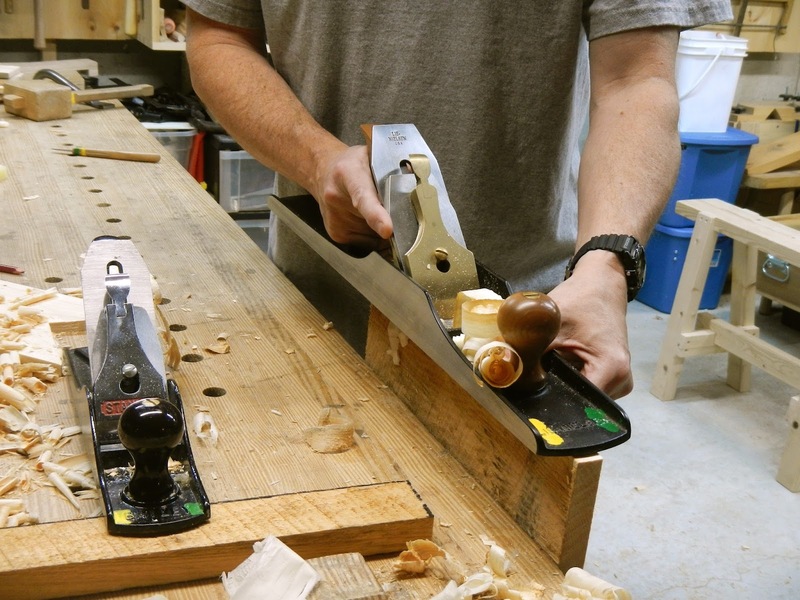 While the jointer has the mass to carry it through the cut, you may find it easier to manage with the smoother. Scribe a line for the length. 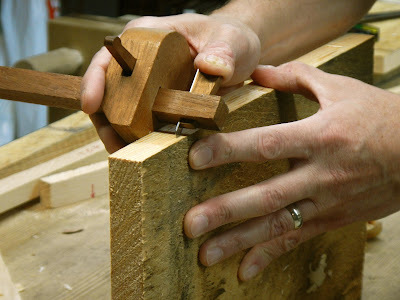 Using a square referenced off the marked edge, scribe across one end of the piece with a marking knife at the desired length. 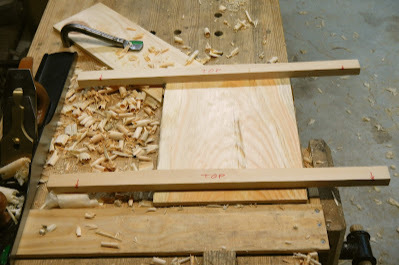 On the bench hooks, saw off the bulk of the excess, but cut just outside the scribed line by about 1/16". The accuracy of this cut doesn't matter as long a you don't go past the line, because the shooting board will clean it up and dial the length in exactly. Saw off the excess length just shy of the line, then shoot it. Shoot the cut on the shooting board. Remember to place the marked edge of the piece against the fence. Watch the plane creep up on the line one shaving at a time and stop when it's dead on. As with the width and thickness, you can fine tune the length as necessary. The piece is now squared up precisely. The processes here allow you turn raw lumber into pieces of exact size in three dimensions. In the breakdown stage, you crosscut to length, rip to width, and resaw to thickness. In the fine dimensioning stage, you plane to thickness, joint to width, and shoot to length, homing in on the final size one shaving at a time. This allows you total control over the final piece. The basics often get ignored. One thing I would add, is not to be scared of this process. The first one (or few) will take a long time, but as with all things, one gets more efficient with practice.